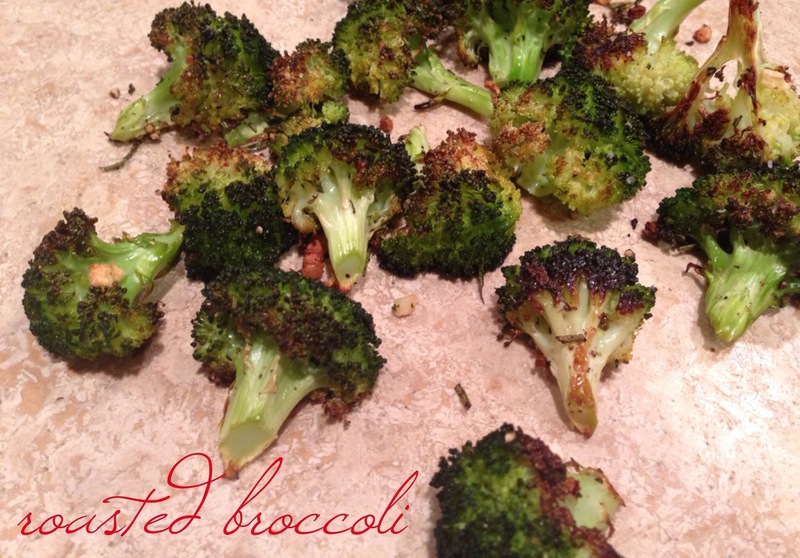 roasted broccoli | Is there any wine left? I used to agree with George H.W. Bush about broccoli being the grossest vegetable. For 28 years, I did not let a floret of broccoli pass through my lips. In fact, I can still barely manage to be in a kitchen when broccoli is steaming because I cannot think of a more offensive smell. And yet, I easily ate 8 lbs. of broccoli in the last month. Why the sudden change? Its like a whole different vegetable. In fact, it doesn’t taste like broccoli at all. Which is the main selling point for me. Basically, it just kind of loses its offensive flavor. It tastes like a crunchy bite of garlic and salt and pepper with a mild vegetable undertone. Roasted broccoli is great as a side dish, but the little florets are the perfect size for popping in your mouth which makes them a smart snack. So, lucky me, I now have a healthy snack that I can put in the rotation with the cheese and cookies. Because they basically cancel each other out, amirite? Cut the florets off of the heads of broccoli. In a bowl, toss them with salt, pepper, garlic, rosemary, and just enough olive oil to coat. Arrange the broccoli in a single layer on a foil-lined cookie sheet. Roast at 425 degrees F for 20-25 minutes until slightly browned. Uhm, I love broccoli. This sounds delish! I used to hate eating most veggies period, but when I started having health problems I had to change my diet. I discovered so many amazing recipes that changed how I looked at food! Not to mention I educated myself about pesticides, GMO, and the like. My favorite recipe is baked kale, or kale chips. All you do is wash some fresh kale (organic because kale absorbs the most pesticides), cut the leaves from the stem, arrange on a baking sheet, spray with olive oil and sprinkle with sea salt. Then bake! Very nutritious as well. I ;m not a fan of broccoli or brussel sprouts much, either. BUT, go get the brussel sprouts and matchstick radish salad at Dolce Vita, 500 Westheimer, ask for Isabella. also get teh radish, goat cheese and walnut salad; fried artichokes; pizza and they make a spaghetti, red sauce, proscuitto, green pea and fried egg pasta for me. I went the one night they had that as a special and the will make it again. YUM! I’ll post an old pic on instagram. Wow! I omitted the rosemary only, but that was only because I’m forgetful. This is great, Katie! !